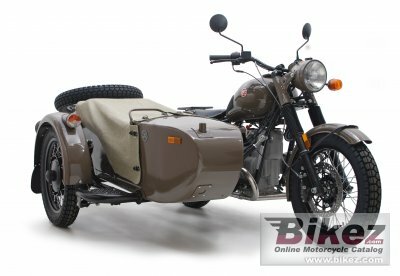 2012 Ural M70 Anniversary Edition. Picture credits - Ural. Submit more pictures. Price as new (MSRP): US$ 14200. Prices depend on country, taxes, accessories, etc. Electrical: FAYTX20HL 12V, 20Amp/h battery. Comments: On 19th of November 1941 the first echelons with the manufacturing equipment pulled up to Irbit, a distant outpost on the eastern slopes of the Ural Mountains. Merely a month after the decision was made to evacuate the Moscow motorcycle plant from the capital. Ahead were long years of the Second World War. Relocated factory was to produce motorcycles for the Army to fight fascists. Thus the story of the Irbit Motorcycle Factory (IMZ) began. The motorcycle was called M72. First units rolled off the production floor just a few months after the evacuation. Altogether approximately 9.500 motorcycles were built and in use throughout the war for mobile troops, reconnaissance detachments and to carry wounded. It was women and children in the distant Siberian factory labouring relentlessly to supply the Front with the motorcycles that defeated the enemy. Like the people who built it, the motorcycles were rugged, resilient, undefeatable. Could have they imagined that 70 years later this factory would remain the only sidecar manufacturer in the world and Ural would become a cult motorcycle� Since 1941 over 3 million motorcycles have been produced by the Irbit Motorcycles Factory. On 19th of November 2011 we are celebrating the 70th anniversary of the IMZ-Ural factory and introduce Ural M70 Anniversary Edition. Ask questions Join the 12 Ural M70 Anniversary Edition discussion group or the general Ural discussion group. Click here to sell a used 2012 Ural M70 Anniversary Edition or advertise any other MC for sale. You can list all available Ural M70 Anniversary Edition bikes and also sign up for e-mail notification when such motorcycles are advertised in the future. Ads with or without pictures are easy to create. Our classifieds are completely free with sections for every country in the world. You can also check out our list of related motorbikes. Compare technical data. Look at photos. View your fellow riders' rating of the bike's reliability, design, engine performance, accident risk, repair cost, etc.